Shin’ichi Suzuki was born in Nagoya (Japan) in 1898. His father was the manager of a factory where violins were made. He starts violin lessons not until the age of 17; there after he goes to Tokyo to study. Later on he goes to Berlin to get lessons from Karl Klinger. In the Berlin of the interbellum period he meets a lot of interesting people, such as Albert Einstein. Einstein teaches him that everyone can learn, provided there is a favourable environment. In 1928 he returns to Japan with his German wife Waltraud who is a singer. 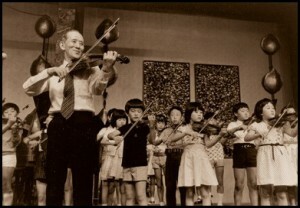 In Japan he is violin teacher and gives many concerts. The beginning of World War II means the end of his career as a soloist. After WW II a lot of children in Japan have been traumatized by the sources of war. Many others have lost their parents. Young orphans are treated as members of his family. Dr Suzuki is asked to provide them with a new reason of existence and a new zest of life. He is eagerly looking for a way to teach all children how to play the violin in order to acquire again a sense of beauty. So he came to the brilliant idea of mother tongue method. It surely wasn’t intended to only tutor young virtuosi, but to give all children the opportunity to develop their musical gift and thus grow up as fine people.